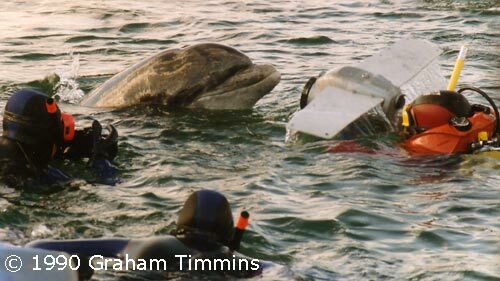 Filming "The Dolphin's Gift". On the right is Cian de Buitlear in diving gear, filming with an 18mm Arriflex movie camera in its waterproof housing, complete with wings to improve stability underwater and on the surface. The dolphin is entranced with all this unusual gear, allowing two novice snorkellers to approach to a distance he would never normally have tolerated.